South Africa's former president Nelson Mandela has been admitted to hospital in the capital Pretoria to undergo tests, officials say. 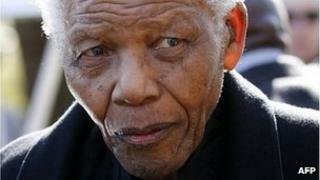 The office of President Jacob Zuma said 94-year-old Mr Mandela was doing well and there was "no cause for alarm". Mr Mandela spent more than two decades in jail under the white minority apartheid regime. He served as South Africa's first black president between 1994 and 1999, and received the Nobel Peace Prize in 1993. Mr Mandela has rarely appeared in public since 2004, when he retired from public life. Nelson Mandela's admission into hospital this weekend is "no cause for alarm" as far as the presidency is concerned but for millions of South Africans who were liberated from apartheid by the 94-year-old statesman, it is indeed a cause for concern. Madiba, as he is affectionately called, is a much loved man. He served 27 years in prison fighting for human rights. When he was released in February 1990 he said let bygones be bygones, essentially forgiving his jailers and the many apartheid government ministers who now live freely in a democratic South Africa. This is partly why the white community, too, loves him so much. In January 2011 he was treated for a serious chest infection, and a year later underwent a diagnostic procedure for an abdominal problem. Officials said on Saturday that he would need medical attention "from time to time" because of his age. There is no information yet on what prompted his admission, says the BBC's Andrew Harding in Johannesburg. Mr Zuma said in a statement: "We wish Madiba [Mandela] all the best. "The medical team is assured of our support as they look after and ensure the comfort of our beloved founding president of a free and democratic South Africa." The statement gave no further details of Mr Mandela's health. Mr Mandela spends almost all his time in Qunu, a rural village close to where he was born. He is known to be frail and his memory is fading, but visitors have repeatedly said he is in good spirits, says our correspondent.